Quatour - Tenth Intervention - progressive new music in New York City. As the Rubin Museum rounds out our Year of the Future, new music collective Tenth Intervention with pianist Adam Tendler present iconic compositions dedicated to the fluidity of time. Tendler returns to the Rubin in this Winter Solstice concert following two sold-out appearances at the Museum. conception and performance. Cage, who often incorporated Eastern thought into his work, consulted the I Ching to set the musical parameters for the piece, and he gave the musicians detailed instructions in how to interpret their graphic scores. “I regard this work as one ‘in progress’ which I intend never to consider as in a final state, although I find each performance definitive,” Cage said about the Piano Concerto, which will be performed simultaneously with his tape lecture, Where Are We Going? and What Are We Doing? (1961). 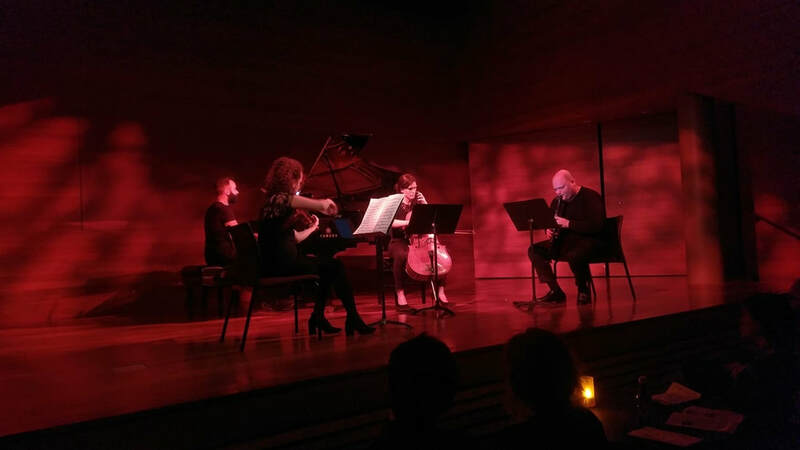 After, Tenth Intervention takes on Olivier Messiaen’s iconic Quartet for the End of Time (1941), composed while Messiaen was a prisoner of war and originally premiered and performed by Messiaen and other inmates within the prison walls.